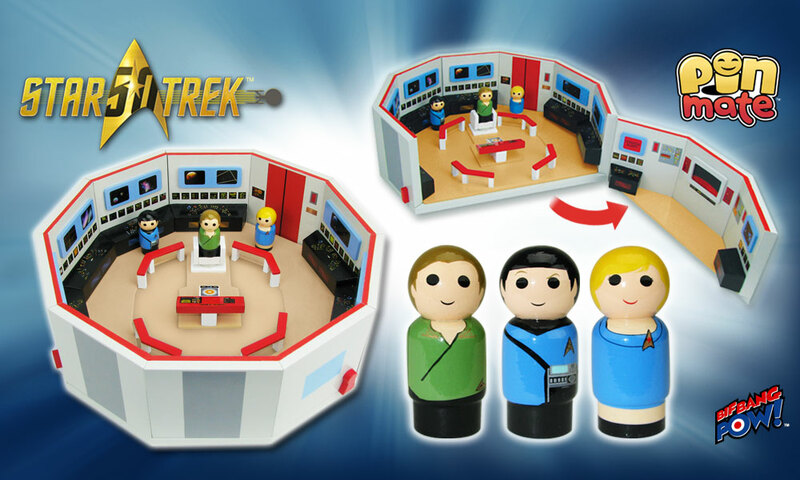 Take an adventure like never before with the Star Trek: The Original Series Pin Mate Wooden Enterprise Bridge Playset with Kirk, Spock and Nurse Chapel – Entertainment Earth Exclusive from Bif Bang Pow! - available for pre-order at Entertainment Earth. 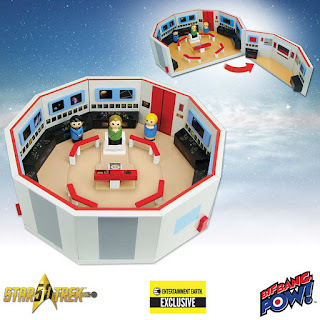 Hop aboard the U.S.S. Enterprise and travel to unknown worlds far and wide for hours of space exploration with this unique and rare wooden playset is designed in a retro-style and features 360-degree artwork on the interior and exterior. Inside, the bridge playset comes complete with a Captain's Chair and various work stations surrounding the perimeter. Plus, you can choose to enjoy the playset from above (with bridge completely intact) or remove the front section of the bridge for tons of eye-level play. Three rare Pin Mate™ wooden figures (Captain James T. Kirk in a green tunic, First Officer Spock in blue, and Nurse Chapel in blue) come with the playset and are also designed with intricate 360-degree artwork that includes hand-painted details alongside limited decals. Each character in the set measures 2-inches tall and is uniquely numbered on the bottom of the figure (as well as on the packaging): Captain Kirk is number 8; Spock is number 9; and Nurse Chapel is number 10. Plus limited to only 500 units, each Entertainment Earth Exclusive set is individually numbered with a holographic sticker. Ages 14 and up. So what are you waiting for? Pre-order today, and travel to unexplored galaxies in the deepest part of the space from your own home! Want more? Check out the complete Pin Mate™ line from Bif Bang Pow! today. TM & © 2016 CBS Studios Inc. STAR TREK and related marks and logos are trademarks of CBS Studios Inc. All Rights Reserved.